In one form or another, toothbrushes have been around for thousands of years. There is evidence that ancient peoples used “chew sticks” — little twigs with frayed ends — to clean their teeth. Thankfully, oral hygiene products have come a long way since then. All we have to do is head to the grocery store and choose from the dozens of toothbrush styles that are available. But which toothbrush is best for you? 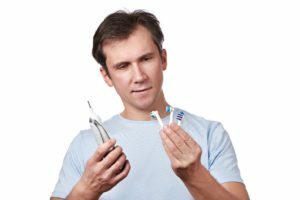 Your dentist is here to offer some handy guidance to help you find the ideal tooth-cleaning tool. An electric toothbrush makes it easy to get a thorough clean without expending a lot of energy. In fact, some brushes deliver thousands of strokes each minute. If you tried to do that with a manual brush, you would wear yourself out in no time. Some electric toothbrushes do more than just move their bristles; they may have a built-in timer that reminds you to start brushing a different part of your mouth. Using an electric toothbrush is fun. If you enjoy brushing your teeth, you’ll be more likely to do it thoroughly and often. Tooth enamel is super hard — in fact, it is even harder than steel — but that doesn’t mean you shouldn’t be gentle with it. If you brush too aggressively, or if you subject your teeth to a toothbrush with hard bristles, you can prematurely wear down the enamel. This can cause sensitivity and perhaps even lead to bleeding gums and gum recession. There is a myth out there that says hard bristles remove more plaque, but that’s not necessarily true. If soft bristles can’t clean your teeth well, it’s a sign that you should go to your dentist for a professional cleaning. Choose one with a head that isn’t too big. It should cover just one or two teeth at a time and be easy to move around your mouth. Look for one with a comfy grip. Let’s of toothbrushes have an ergonomically designed handle that is super easy to hold onto. Your dentist and the hygienists in their office are full of oral hygiene wisdom! If you’re struggling to find the right toothbrush, schedule a dental visit and bring a list of all the questions you have about how to care for your teeth. The dentist may recommend that you use a specific product and give you some personalized tips on how to keep your smile healthy and beautiful. Shopping for a toothbrush? We hope these tips help you find the perfect one! Dr. Drew Vanderbrook is your friendly dentist in Lakewood. He enjoys getting to know his patients and educating them about their oral health. If you would like to talk to him about how to maintain your smile, please contact our office at 214-821-5200.